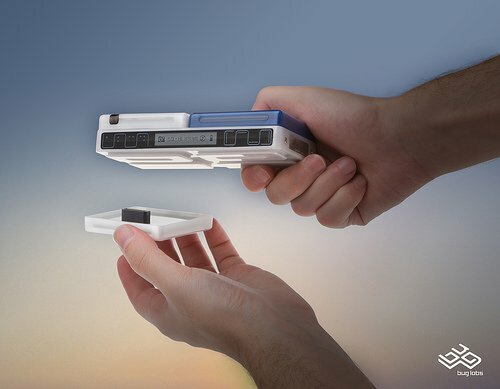 American technology company Bug Labs has developed a system where consumers combine modular electronic devices to build their own ideal gadget (via Protein OS). 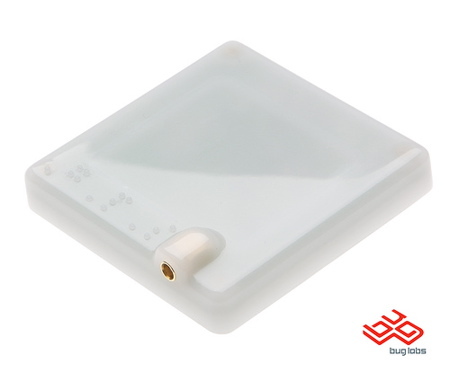 Called BUG, the system consists of a BUGbase with four connectors so that different elements can simply be snapped onto the sides. It was unveiled at the International CES consumer electronics show in Las Vegas earlier this month. 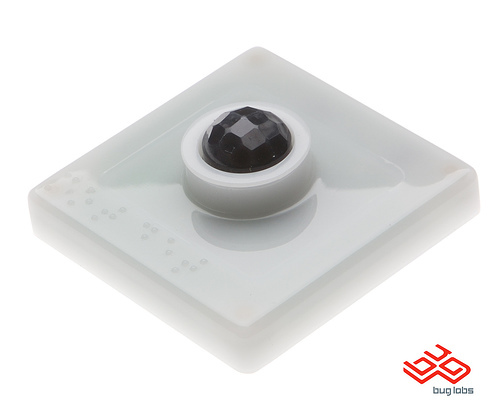 Four modules will be available to start with: GPS, digital camera and videocam, touch-sensitive colour LCD screen, and accelerometer and motion sensor. Other modules will be added later this year, including a teleporter apparently. BUG is a collection of easy-to-use electronic modules that snap together to build any gadget you can imagine. 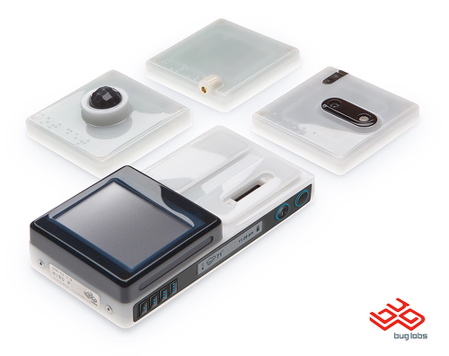 Each BUGmodule represents a specific gadget function (eg: a camera, a keyboard, a video output, etc). You decide which functions to include and BUG takes care of the rest letting you try out different combinations quickly and easily. With BUG and the integrated programming environment/web community (BUGnet), anyone can build, program and share innovative devices and applications. We don’t define the final products – you do. BUG helps you explore the realm of personalized devices and applications, and find ways to solve many of the problems current gadgets can’t. For example, with BUG, you can easily assemble and program a GPS + digital camera device that automatically publishes geo-tagged photos as a web service. 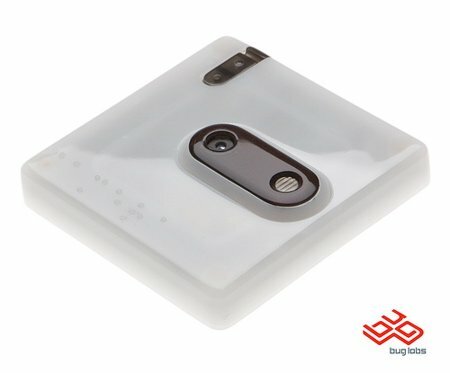 Integrating with an online photo-sharing service like Flickr is only a few more lines of code away, and now you have your own real-time, connected traffic-enabled mobile Webcam! The platform is designed to enable a collaborative development environment. BUGnet, our online community, is tied in directly to the BUG SDK, which allows developers to connect with others, share information, and jointly build products or services. BUGbase is the foundation of your BUG device. It’s a fully programmable and “hackable” Linux computer, equipped with a fast CPU, 128MB RAM, built-in WiFi, rechargeable battery, USB, Ethernet, and a small LCD with button controls. It also has a tripod mount because, well, why not? 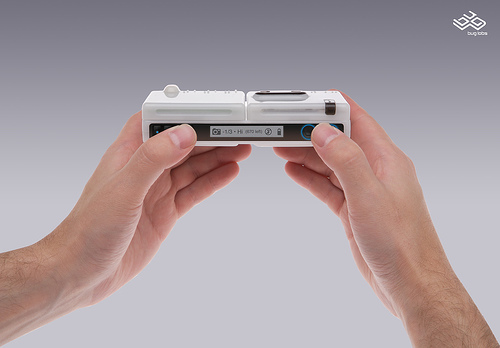 Each BUGbase houses four connectors for users to combine any assortment of BUGmodules to create their ultimate gadget. 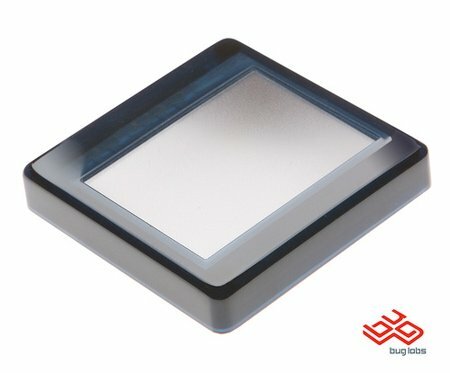 BUGmodules are the functional components used to add capabilities to your BUG device. Each module connects to the BUGbase, and installing and swapping modules is literally a snap. Each additional module exponentially increases the overall function of your BUG, and every combination unlocks virtually unlimited new potential devices. 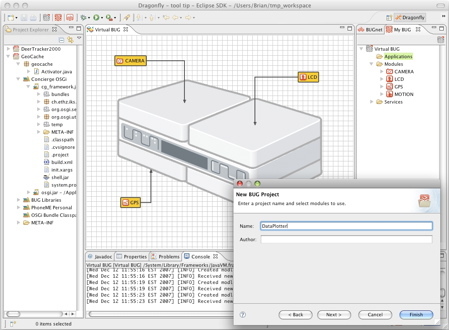 BUG is built entirely with open source software. BMI, the BUG Module Interface, attaches devices to the BUG. Device-based services and applications are dynamically available based on which modules are connected to the BUG. Higher up the stack is Java, which hosts a service-oriented component runtime called OSGi. Java and OSGi make creating new BUG applications simple and intuitive, as BUG applications are essentially one or more bundles. In addition, each BUGmodule launches an OSGi bundle which in turn creates services for other components to consume. BUG applications are created using the BUG SDK (internally named Dragonfly), and are shared with other developers and users through BUGnet, our online community. 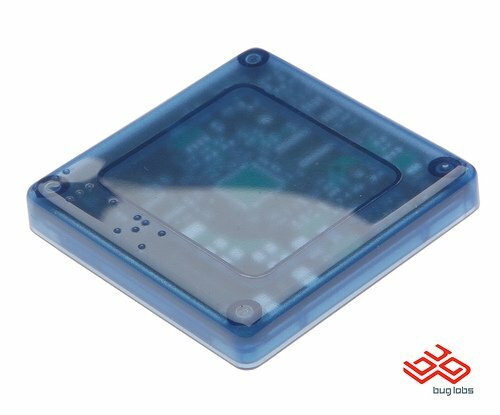 Bug Labs is a new kind of technology company, enabling a new generation of engineers to tap their creativity and build any type of device they want, without having to solder, learn solid state electronics, or go to China. Bug Labs envisions a future where CE stands for Community Electronics, the term “mashups” applies equally to hardware as it does to Web services, and entrepreneurs can appeal to numerous markets by inventing “The Long Tail” of devices. Bug Labs didn’t just start with a dream or a vision. As kids, we were more likely to take apart new toys than actually play with them, just to see what was inside. As teenagers, personal computers were still new and as much a challenge to tinker with as they were to operate. With BUG, we want people to recapture and share this excitement again, and we want them to apply this to their everyday device. We believe everybody is an inventor at heart, so we’ve developed a platform for users to create and forever modify their favourite gadget, allowing for ultimate customization and use.